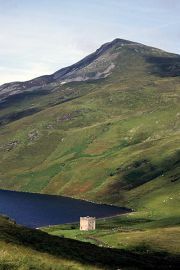 A tower-house stands at the head of Altan Lough in the Highlands of Donegal. 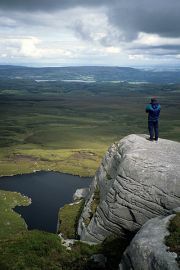 A walker looks northwards from a gritstone outcrop near the summit of Cuilcagh in Co Fermanagh. 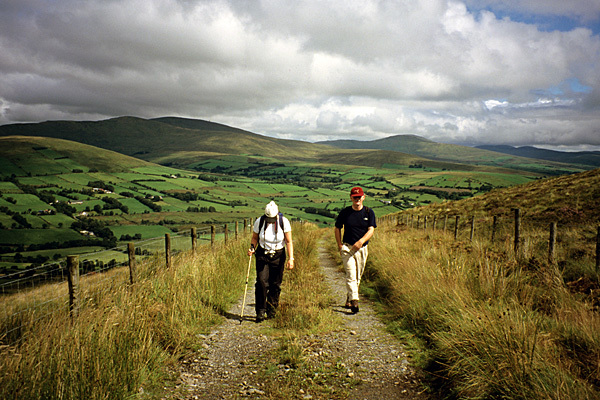 Walkers follow an old track through the Sperrin Mountains. The northern book was requested first and was planned to cover a series of walks throughout the length and breadth of the ancient Province of Ulster. The route research was conducted in a solid month of walking, checking a total of 31 rich and varied one-day walks, from the rugged Highlands of Donegal to the Mountains of Mourne. A brief account of the long-distance Ulster Way was added afterwards, based on an earlier walk around that enormous circular route. Well, the book was good news for the North, but even while the route research was in progress, a decision was taken by Ward Lock to put the rest of Ireland in a single volume, instead of producing three more books, a Province at a time. In a review in TGO (The Great Outdoors) magazine, Mike Harding described Paddy Dillon as "a one-man writing factory on Ireland."